This species is accepted, and its native range is Sierra Leone to Eritrea and Tanzania. Perennial. Culms erect, or rambling; slender; 20-60 cm long. Ligule a ciliate membrane. Leaf-blades spreading, or reflexed; lanceolate; parallel-sided; 3-7(-12) cm long; 5-15 mm wide. Leaf-blade venation without cross veins, or with distinct cross veins. Leaf-blade surface glabrous, or pilose. Leaf-blade apex acute, or acuminate. Inflorescence a panicle. Panicle open; ovate; 4-6(-13) cm long. Panicle branches capillary. Spikelets solitary. Fertile spikelets pedicelled. Spikelets comprising 1 basal sterile florets; 1 fertile florets; without rhachilla extension. Spikelets oblong; dorsally compressed; obtuse, or acute; 2-2.5(-3) mm long; falling entire. Glumes similar; reaching apex of florets; thinner than fertile lemma. Lower glume oblong, or ovate; 0.66 length of spikelet; membranous; dark green; without keels; 3(-5) -veined. Lower glume lateral veins ribbed. Lower glume surface glabrous, or pubescent. Lower glume apex obtuse, or acute. Upper glume ovate; 1 length of spikelet; membranous; dark green; without keels; 7 -veined. Upper glume lateral veins ribbed. Upper glume surface glabrous, or pubescent. Upper glume apex acute. Basal sterile florets male; with palea. Lemma of lower sterile floret similar to upper glume; ovate; 1 length of spikelet; membranous; 7 -veined; acute. Fertile lemma oblong; dorsally compressed; 1.5-2.5 mm long; indurate; pallid; shiny; without keel. Lemma margins involute. Lemma apex obtuse. Palea involute; indurate. In forest, and in grassland just above the forest limit. Perennial; culms 20–60 cm. long, rarely more, slender, trailing or erect. Leaf-blades spreading or deflexed, lanceolate, 3–7(–12) cm. long, 5–15 mm. wide, straight at the base, cross-veins present or absent, subglabrous or sparsely pilose, acute to acuminate. 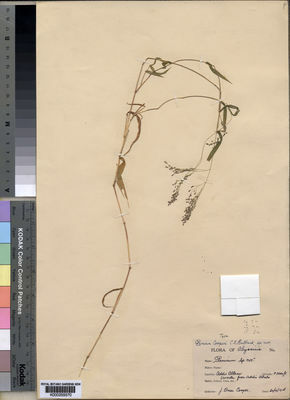 Panicle ovate, 4–6(–13) cm. long, finely branched. Spikelets oblong, 2–2.5(–3) mm. long, dark green, strongly striate, often sparsely pubescent, rarely glabrous or scaberulous, obtuse or acute; lower glume ovate or oblong, 2/3 the length of the spikelet, 3(–5)-nerved, obtuse or acute; upper glume ovate, as long as the spikelet, 7-nerved, acute; lower lemma 7-nerved, male, its palea well developed; upper lemma pale, shining. Panicum patens Hochst. ex Steud. Robyns, Flore des Spermatophytes du Parc National Albert 3: 108 (1955). Robyns, Fl. Agrost. Congo Belge 2: 210 (1934). Steud., Syn. Pl. Glum. 1: 90 (1854).